I've cut out the templates for the new board and just finished making the rails up. This time the process and the outcome was far superior to the first attempt. 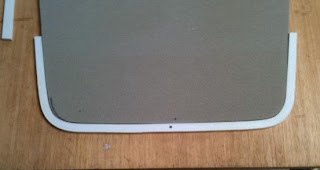 In the first attempt I traced the core out on the ABS plastic sheet and cut the plastic exactly to shape. There were 2 things wrong with this i) It wasted expensive plastic because there are now pieces of plastic with curved edges that can't easily be used for anything and ii) I hand cut the plastic because the dremel like tool I've got spun at a rate that melted the plastic so I needed to cut it out with a hacksaw and this took about hours where I only took out time to swear at the fucker. This time a very different story and a great outcome. 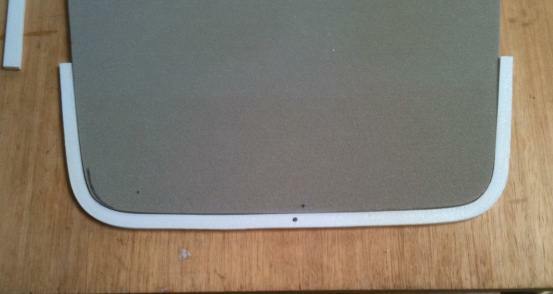 I used a jigsaw with a metal cutting blade to cut long straight strips 10mm wide. To help get the thickness constant I put a small G-clamp on the base plate 10mm in from the blade so that I had a good guide. I did the same at the front and back of the base plate so that the blade would run parallel to the edge. I cut of 3 long strips - 2 x long edges and another to be cut in half for wrapping around the tips. Then , thanks again to Brokites video, I took the half length and heated them slowly over a gas BBQ to get them to soften them. There is a critical temperature at which the plastic looses its rigidity and becomes like Plasticine. I took the softened ABS and shaped it around the tips and bingo a perfectly shaped rails to wrap around then end of the board and down the length of it for about 10cm. It wasn't necessary to heat the side rails cause there is so little curvature in them that it will be very easy to stick them in place. The result is perfectly formed rails. Before I stick them on the board I will rough them up with 80 grit sand paper and flame them again as I believe that this changes the surface chemistry of the plastic and forms a better bond with the epoxy. Whats it going to cost?? The Birth of a Brand!!! Board Project 2 - The outline and rocker. Where to remove glass from ?